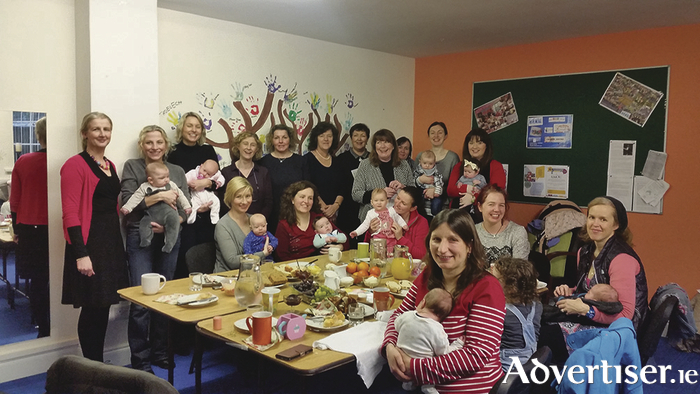 Le Cheile Community and Family resource centre Castlebar hosted the relaunch of the breastfeeding support group last week in Le Cheile Family Resource Centre. This project is a joint community initiative between Le Cheile FRC and public health nurses from HSE West. A public health nurse attends the group on a weekly basis. Ann Conway, project manager with Le Cheile FRC, welcomed all the mothers, babies, the public health nurse, and directors of nursing from the Primary Care Team in Mayo. The breastfeeding project started in Le Cheile Family Resource Centre six years ago and provides a important link and resource for parents. Ms Conway said: “We provide a meeting space and advertise and update our Facebook page weekly. We also host an annual get together to celebrate breastfeeding awareness month, usually in October. A community project like this works well where there is joint partnership such as the public nurses as they provide the professional advice first hand and the network itself provides that valuable support of mother to mother. The early weeks as a new mum can be exciting, overwhelming, and breastfeeding can be challenging but support and network is vital. Surrounded by other moms and babies, you will gain confidence in breastfeeding. Mothers are welcome to attend during pregnancy"
Christine Coll, public health nurse with HSE West, said: "Ireland has the lowest breastfeeding rate in Europe at present. In 2015 the Irish breastfeeding rate was 56 per cent (the European rate was 90 per cent ). In Mayo the 2015 rate was only 47.8 per cent. In view of this, the public health nurses in the Castlebar primary care area have committed to try to improve the start up of breastfeeding rates and support mums to continue breastfeeding for at least six months, and being part of this project with Le Cheile Family Resource Centre, this is what we are hoping to achieve." She added: "The service we provide to the mums at the support group includes the following; encouragement to mums to continue breastfeeding, assessment of feeding techniques and advice on same, identifying problems and finding solutions to any problems that arise, advice regarding the wellbeing of the baby, eg, checking the baby’s weight and monitoring the baby’s development, reiterating the benefits of breastfeeding for both baby and mother, talking to mums about the role dads have in caring for a breastfed baby, providing advice about expressing breast milk if required, providing information about returning to work and continuing breastfeeding, a listening ear for mums." If you would like to attend the breastfeeding support group it takes place every Thursday from 11am until 12.30pm in Le Cheile Community and Family Resource Centre, Tucker Street, Castlebar, or for more information contact (094 ) 9025126.